The cubes with the Sustainable Development Goals are Cradle to Cradle certified, but what does that actually mean? Cradle to Cradle is the ultimate environmental certification. With Cradle to Cradle, the product’s entire life cycle is analysed. Only substances capable of being part of natural cycles and having no harmful effect on human beings or on the environment may be used. The product must be able to be part of a biological or technical cycle so that it does not generate waste. The organisation must be carbon neutral and must use 100 percent renewable energy for all processes. Process waste water must be clean enough to drink, in theory. The organisation must demonstrate social responsibility based on recognised standards – for example, the Global Compact initiative. In addition, Cradle to Cradle certification requires continuous improvement of products and processes. 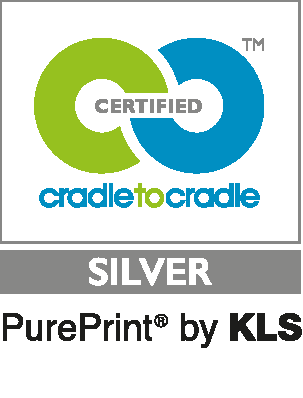 KLS PurePrint is one of only three printing houses in the world that are Cradle to Cradle certified.